Philip Kennicott of the Washington Post has written a lengthy piece worth the time of anyone interested in the history and fate of our national battlefields. A cottage industry has arisen in the last ten-fifteen years that analyzes the fascinating topic. It is more complicated than this, but one of the problems with battlefield preservation was the implementation of the so-called Antietam Plan in the late nineteenth century. In a nutshell: the Federal government, unwilling to take on new expenses and liabilities, created a barebones Antietam military park, laying a ribbon of right-of-way surrounded by existing farms. 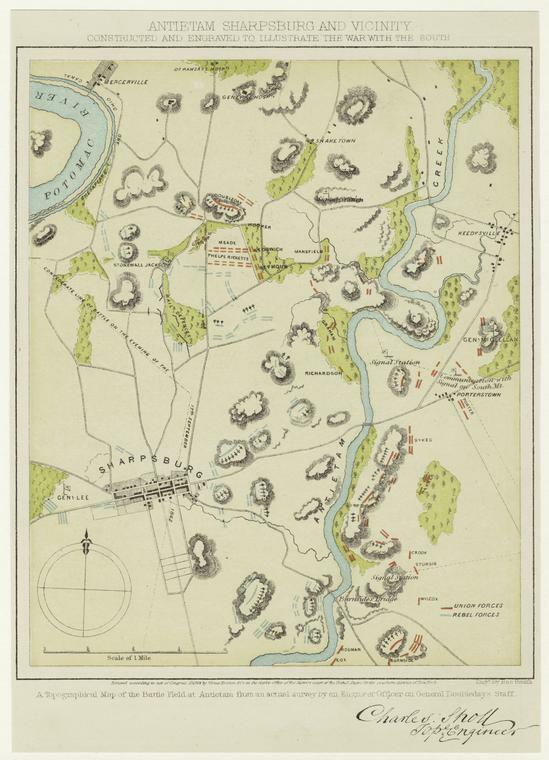 With a few exceptions, the Antietam Plan was the norm at all new parks in the coming decades. This was not so much of a problem in, say 1925, when the population of the Greater Washington DC area was still minimal. The land where the fighting took place looked much the same during the Coolidge Administration as it did in 1862. Things changed dramatically in the Automobile Age. For heritage tourism this was not entirely bad. How many anecdotes have you heard from people who remembered visiting a Civil War battlefield during the Centennial? Dad’s Buick is what made that happen. However, the rise of the automobile also led to the building of the interstates, which in turn led to suburbia, which led to encroachment into areas surrounding once untouched battlefields. Now, the Antietam Plan is creating challenges as sprawl shows no signs of abating. For reasons that need no explanation, most of the battles in the Eastern Theater were fought in the 100 miles or so between Washington and Richmond. The DC area has changed markedly in recent decades. One sees the changing demographics all around. None of this is “wrong.” My family is part of these changes. We rent an apartment in Virginia, shop at the local big box stores to buy our paper towels and other housewares, and are figuring out little-by-little where to find the small pleasures of modern life we have come to expect and enjoy. We live in the twenty-first century. This past Sunday friends visited the Hayfoot at our apartment and said the area had evolved a great deal in just the few years since they themselves moved to a different part of the region. The extension of the Metro will accelerate the change even more. There are no easy answers when it comes to preservation. 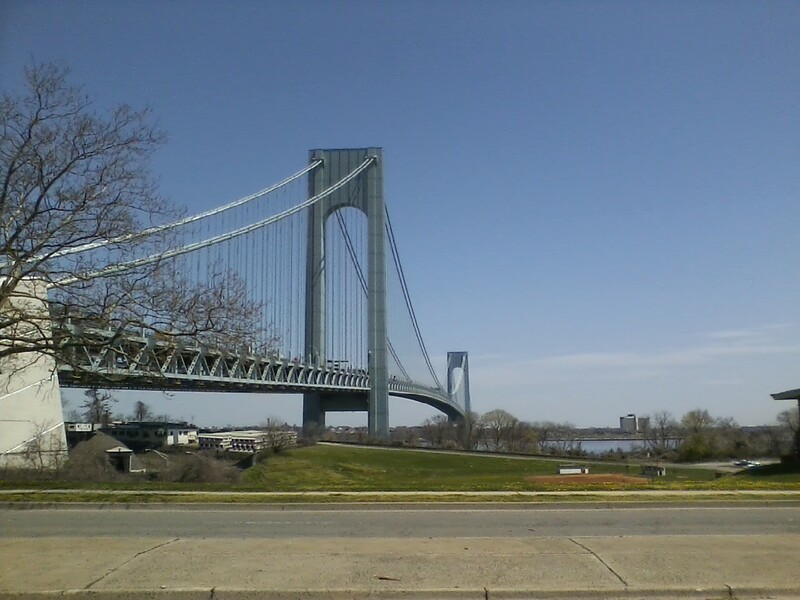 A friend and I went to Fort Wadsworth yesterday. 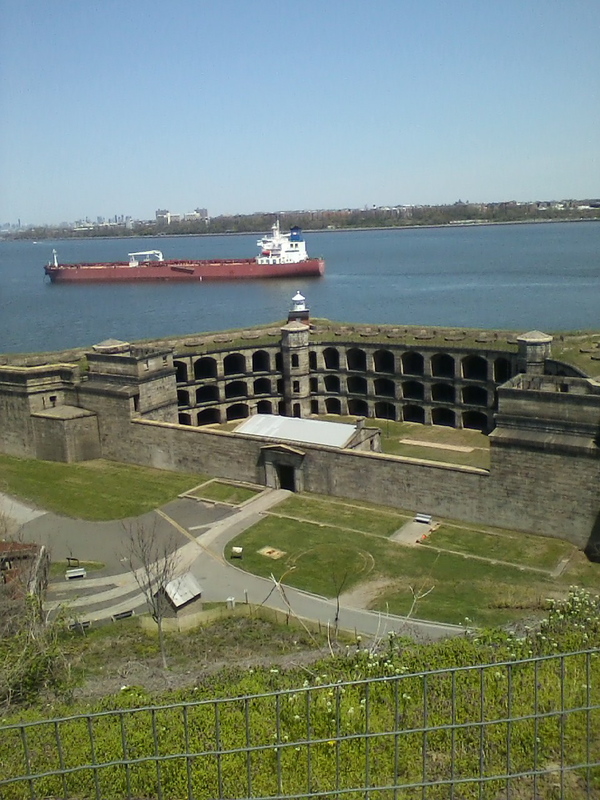 The last time I was there was two years ago, when the Hayfoot and I visited the group of fortifications in Staten Island with someone we know. It is always a bit of a journey getting to these types of places in the outer boroughs. The way we go entails taking the subway to Bay Ridge and then a bus across the Verrazano. Bay Ridge is its own corner of New York City, and one that at least on the surface looks the same as it always did. You half expect to see Tony Manero strutting down the street eating two slices of pizza, stacked on top of each other of course. Wadsworth is part of the Park Service’s Gateway National Recreation Area, which was created forty years ago to provide the ten million or so people in the Greater New York area with recreational and other opportunities. Golden Gate National Recreational Area was founded at the same time. Gateway success has been mixed. Millions visit its beaches every year, providing opportunities for those who otherwise might have to do without. It has also saved significant acreage of natural habitat, and created even more. It is strange to be hiking in marshland while seeing the Manhattan skyline in the far off distance. That’s Gateway. At the same time the consortium of sites has always had something of an identity crisis, struggling as it tries to be many things at once. Access is difficult. The infrastructure in many parts is aged and dilapidated, with predictable results on visitation statistics. Gateway’s roots go back decades before the creation of the recreation area; in the 1930s and 1940s Robert Moses was active in many projects that eventually came under one umbrella in 1972. The storm of October 2012 is a tragedy and an opportunity for the various sites that make up the recreation area. Cathy Newman of National Geographic has more on the story. She won me over when she called Moses the “master builder,” and not the psychotic “power broker” we have been force fed by Robert Caro. The Park Service, States of New York and New Jersey, and City of New York seem to be grasp the historical moment. There are significant challenges as well. It will be interesting to see what happens in the next few years. I was surfing Ye Olde Online Bookseller the other day and couldn’t help but notice that the first of the WW1 centennial titles will be hitting the shops this fall. The books I perused were not being advertised as such, but I have no doubt that publishers have been signing historians for these projects in recent years with the anniversary in mind. I was especially glad to see that Margaret McMillan will have a new book, The War That Ended Peace: The Road to 1914. Her Paris 1919 is one of the authoritative books on the Versailles Treaty and its aftermath. When I saw the news of her upcoming title I couldn’t help but think of something a history prof told me once, more as aside than anything. He said it is often a wise move to write history backward, because you know at least the basic outline of events going in. I have no doubt that Professor McMillan’s latest will rise to her usual high standards. A few of us at work were having coffee the other day when we got on the subject of the Great War centennial. Someone wondered aloud to the group if there was a specific date one can christen as the anniversary of the war. In comparison, there is no 100% consensus on the anniversary of the Civil War sesquicentennial, but Fort Sumter is the most common answer. For World War 1 it could be the assassination of Archduke Ferdinand, 28 June 1914; Austria-Hungary’s attack on Serbia on 28 July; or any of the succeeding dates of mobilization for the various principle participants. I suppose the anniversaries might and will vary from country to country. The United States did not become officially involved until 1917; I would be surprised though if the World War 1 Centennial Commission waited until 2017 to unroll its commemorations. Here is a piece, with remarkable photos, about a massive undertaking currently underway in Europe to refurbish many thousands of headstones. I have been to Flanders Fields and can testify that it is powerful and moving to see. I am making it a goal right now to get back in the next few years during the anniversary. It will be interesting to see if the commemoration of the Great War will lead to a paradigm shift in our understanding of the conflict, which would be something given that so many of the problems in the world today can be traced, at least in part, to ’14-’18. Whatever happens, it will be worth watching. The other night I was sitting on the sofa when the voice of Levon Helm wafted from the other room. The Hayfoot was watching a video clip of “The Night They Drove Old Dixie Down.” Instinctively I got up and went into the bedroom, where we watched it lying down. Like so many other songs sung by Helm–“Up on Cripple Weight,” “Don’t Do It,” The Weight”–it never fails to move. Sadly, the voice has been silenced; Helm died of throat cancer in New York City on Thursday. The drummer was born in the Mississippi Delta town of Elaine, Arkansas and grew up in nearby Helena. When he was a teenager Helm became the percussionist for Ronnie Hawkins. The two Arkansans eventually ended up north of the border and playing in a unit known as Ronnie Hawkins and the Hawks. 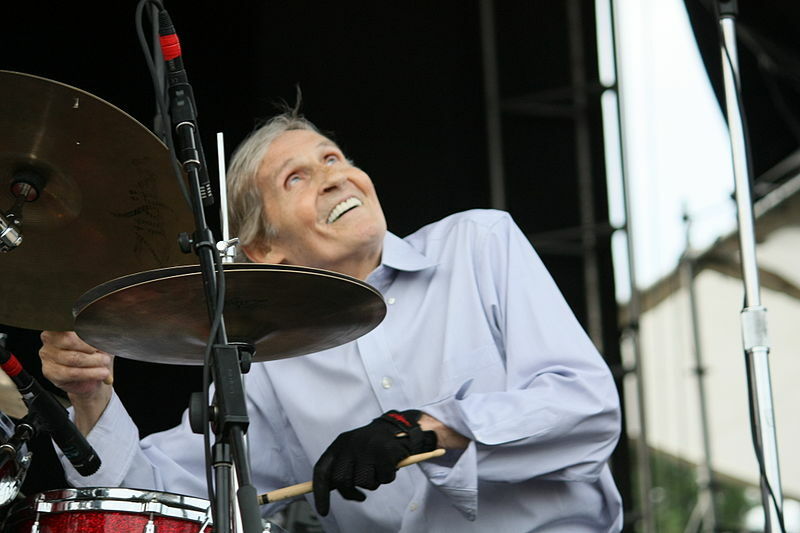 After breaking off from Hawkins, the unit morphed into Levon Helm and the Hawks. Soon they were backing Bob Dylan just as the Hawks. Eventually the five members of the group–Helm, Robbie Robertson, Rick Danko, Richard Manuel, Garth Hudson–went out on their own as simply…The Band. The group released its first album, Music From Big Pink, in July 1968. Big Pink was the group’s rented communal house in upstate New York. The album is notable for many reasons. First, it was a fully realized piece of work, created by musicians who had already woodshedded for a number of years. Released during the worst excesses of the Age of Aquarius, Big Pink manages to avoid the indulgences of the era. The reason for this, I believe, is because Helm especially was so grounded the American Songbook. You can’t have been a musician growing up in the Mississippi Delta in the 1940s and 1950s and not absorb its traditions. The first music group Helm saw in person was Bill Monroe and the Blue Grass Boys in 1946, the incarnation of that band that included Lester Flatt and Earl Scruggs. He was six years old. Helm later saw Elvis play in person several times–Memphis being less than an hour’s drive from Helena–before the man who would be King was a cultural phenomenon. Tradition meant a great deal to Helm and to everyone in The Band. 1968 was a year of turmoil throughout the world. A short list of incidents include: the Tet Offensive, the assassination of Martin Luther King Junior and subsequent rioting in hundreds of American cities, the Events of May in Paris that almost overthrew the French government, and the assassination of Bobby Kennedy in June. And that is just the first six months of the year. At a time when the battle cry for many baby boomers was “Don’t trust anyone over 30,” the group members pointedly posed with their extended family wearing their finest for what would be a widely disseminated group photo. Roots. The Band’s original incarnation dissolved in 1976 after the famous Winterland concert filmed by Martin Scorsese and released as The Last Waltz in 1978. The breakup was probably inevitable given the tension, creative and otherwise, between Mr. 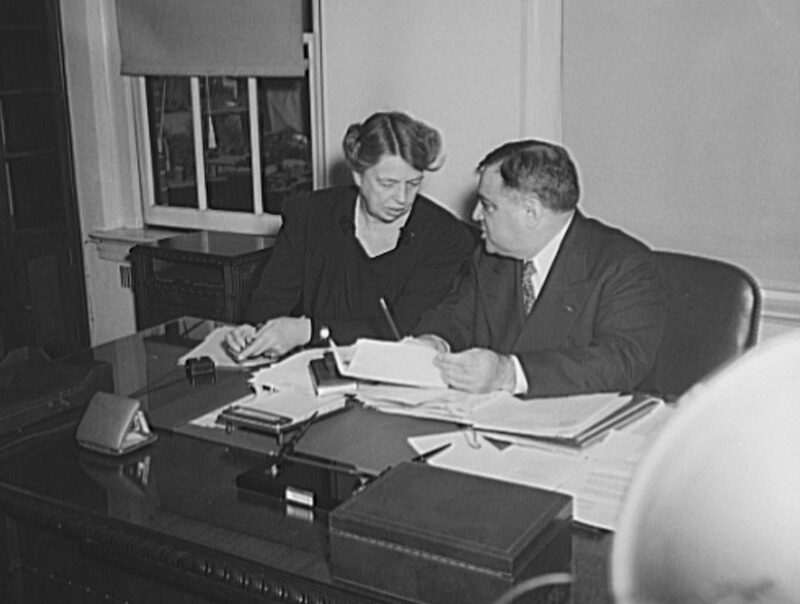 Helm and Mr. Robertson. Helm later went on the road with other iterations of the lineup but to less effect. He was first diagnosed with cancer in the late 1990s and fought the disease, with periods of remission, up until the end. Helm was always an active musician, but in part to pay his medical expenses he was especially productive over the last several years of his life. Two of his finest efforts came during this period: Dirt Farmer (2007) and Electric Dirt (2009). He was proof positive that a rock star can age gracefully if he acts his age and stays himself. With some artists it is just a lifelong thing. Thankfully for us. The Hayfoot was home for an all-too-brief visit this weekend. We intended to go to the New York Botanical Garden yesterday but decided to stay near the house instead. Waking early and getting all the way to the north Bronx just didn’t seem worth it. The weekend was for catching up, and catching our breath after the many changes of the last two months. It was good to hang out with those we care about. One thing we discussed yesterday was the logistics of our annual June trip to Gettysburg. It is going to be a little complicated, but things have a way of falling into place. Today, as if on cue, I opened the mailbox and found an envelope from the Seminary Museum Museum. 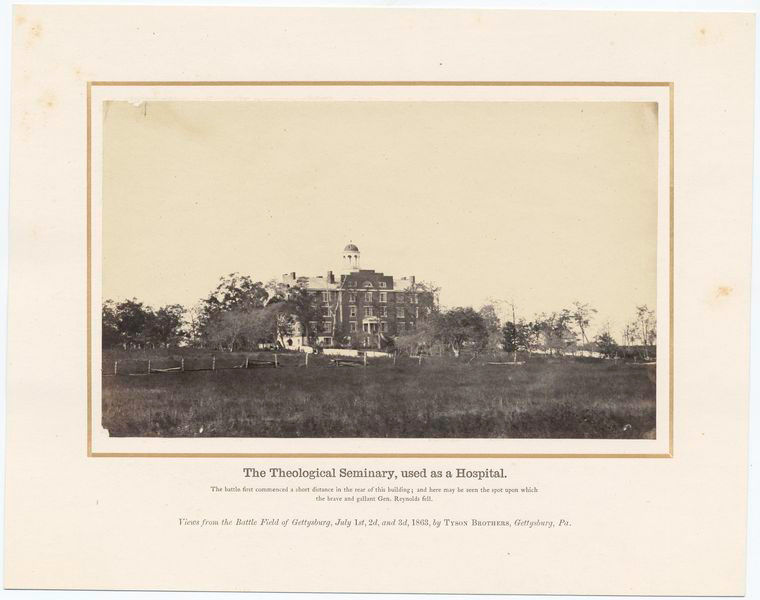 This new institution is located on the campus of Gettysburg’s Lutheran Theological Seminary and will open, appropriately enough, on July 1. I remember driving past the old building last year and seeing the renovations underway. They are doing a beautiful job. Unfortunately we will be missing the museum this year, as our visit falls before the battlefield anniversary. I would love to see it, but it is probably just as well; the museum will undoubtedly be a mad house in its opening weeks, which is without question wonderful but a pain for someone averse to crowds. This year in particular we are going to see some of the off-the-beaten-path sites, parts of Culp’s Hill, East Cavalry Field, and the like. (The evolution of why once heavily-visited parts of the battlefield now receive so little interest, and vice versa, is fascinating in and of itself.) The Gettysburg sesquicentennial seems an opportune time to see the more obscure locales. Maybe if we are lucky we’ll talk friends into going to Gettysburg later in the year, when the crowds will be smaller. Whenever you are planning to go to Gettysburg, make certain to add the Seminary Ridge Museum to your must-see list. One of the most tender and compassionate of men, he was forced to give orders which cost thousands of lives; by nature a man of order and thrift, he saw the unutterable waste and destruction which he could not prevent. The cry of the widow and the orphan was always in his ears; the awful responsibility resting upon him as the protector of an imperilled republic kept him true to his duty, but could not make him unmindful of the intimate details of that vast sum of human misery involved in civil war. When I was wrapping up my second masters degree at the CUNY Graduate Center in the fall of 2005 I vowed that when I finished I would take it upon myself to learn a second language. I had actually minored in Russian as an undergrad, but that had been a decade and a half earlier and my Russian was, to put it mildly, rusty. I chose Russian because my brother and I had made a trip to Europe in November 1989 that included West and East Germany, Poland, and the Soviet Union; when I returned to my studies in spring 1990, six weeks or so after the fall of the Berlin Wall, I had vague notions of learning the language and being part of the post-Cold War period in a direct and immediate way. As you might imagine, it did not work out that way. Maybe it is living in New York, or perhaps it is that my brother now lives in France, but I realized as I was finishing school in ’05 that one needs, if not full-fledged bilingualism, at least a working knowledge of another language. 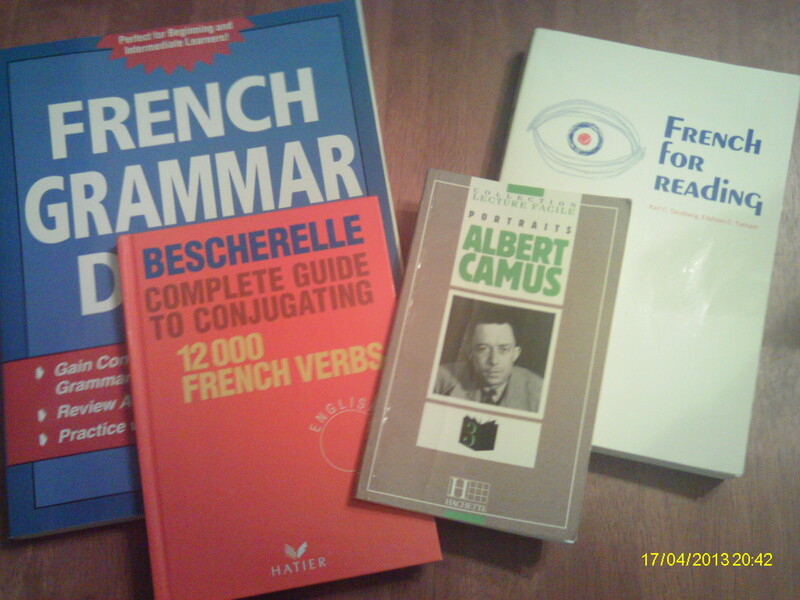 In the winter of 2006 when it was time to begin I narrowed it down to French and German. I chose French because I thought it could help me in more of the world than German probably could. I would still like to travel within the Francophone world. Things were going well in my studies until some major life changes required me to focus–quite happily–on other things. Today, after a long hiatus, I pulled out my lesson books and came up with a plan to brush off the dust and bring my French up to where I want it to be. My goals are 1) to be able to converse in basic French when entering a hotel, restaurant, or similar social setting, and 2) to read and write at at the high-intermediate level. Certainly I can find 45 minutes a day to make this happen. As I said in my post the other day about the 1960s, I have become increasingly aware of the need to think holistically and not pigeon-hole oneself. Currently, I am about a quarter of the way through the late Warren Zimmermann’s First Great Triumph: How Five Americans Made Their Country a World Power. Triumph tells the story of how Teddy Roosevelt, Elihu Root, John Hay, Henry Cabot Lodge, and Alfred T. Mahan did just that in the late nineteenth and early twentieth century. The reason I say all this is because to me the book is reinforcing the importance of thinking wider than 1861-1865 to understand the Civil War. Hay is an especially interesting character because he started of course working for Lincoln in 1860 and was still serving his country and president three and a half decades later. This included several stints overseas. Often we think the people who fought in the Civil War, or who served in whatever capacity in which the served, lived hermetically sealed in those four years. Of course, they did not. So, here I am up to my elbows in the imparfait and passé composé yet again. It feels pretty good. This morning I finished Eve of Destruction: How 1965 Transformed America by James T. Patterson. I often read in cycles, and Eve was the third of a three-part installment, if you will, in a project to read more about contemporary history. Five years ago, just prior to my first visit to Gettysburg, I made a conscious effort to raise my game regarding Civil War history. I feel I have done that, though I still have a ways to go. I have gained a great deal, but recently I felt I was losing my mojo in other areas. There are only so many hours in the day; every time you are doing one thing by definition you are not doing something else.I believe so many focus so intently on the Civil War, especially those who dwell on the minutiae of the battles, that they lose something. 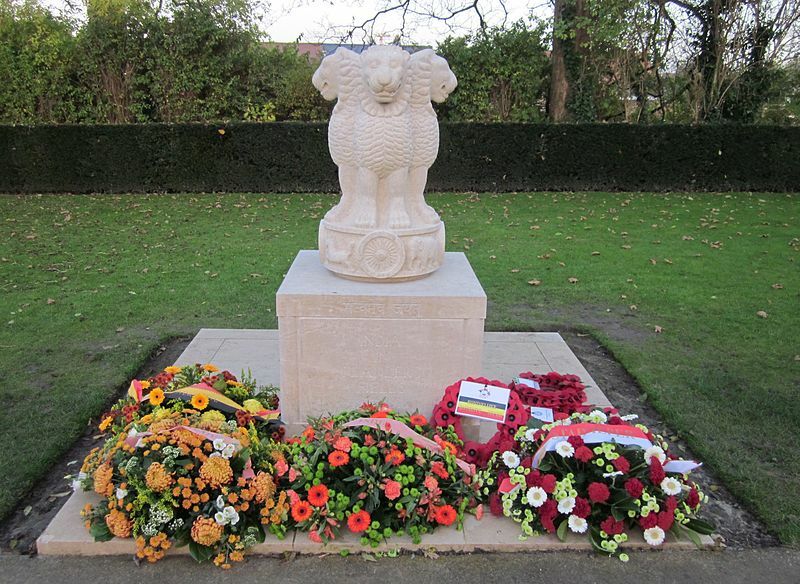 One cannot understand the war, or our complicated history, without context. In his preface Patterson makes clear that no one year can “change everything,” as the blurbs and subtitles often shout to us when we walk the aisles of the local bookstore. Life just doesn’t follow the calendar like that. Still, as Patterson shows, 1965 was a transforming year in American history. The assassination of Malcolm X, Selma, Vietnam escalation, Watts rioting, Voting Rights Act, immigration reform, the alphabet soup of Great Society programs that President Johnson felt secure to create after being given a mandate during his landslide victory in November 1864 and inauguration in January 1965. Not for nothing did Johnson proclaim during the lighting of the national Christmas tree in December 1964 that we were living in “the most hopeful times in all the years since Christ was born in Bethlehem.” It was typical LBJ hyperbole, but as was the case with many of Johnson’s pronouncements it had a ring of truth. Ironically, America’s prosperity and hopefulness are what led to to the anger and cynicism of the era as it became clear that our many problems were not so easy to fix. Culturally things were changing as well. The Beatles released Rubber Soul at the end of the year. It is hard not to believe that 1965 was the year that the sixties became The Sixties. I have added Patterson’s Grand Expectations, the United States, 1945-1974 to my short list. I just back from the city. This evening I went with a friend from work to see Passages through the Fire: Jews and the Civil War at the Jewish Museum on 16th Street. The recently opened exhibit is co-sponsored by Yeshiva University Museum and the American Jewish Historical Society. It was quite the New York evening, complete with dinner afterward at a coffee shop down the street from the museum as the rain pounded down outside. Tonight was actually the curator’s walk-through. Last month, a few days after the exhibit began, I tried to rsvp for what I thought was the only such event; to my surprise the coordinator emailed back to say they were booked. Again to my surprise, she said I could book for April. The curator talks are apparently once a month affairs. I was glad we went tonight to get the curator’s perspective. It is a part of Civil War and United States history we do not hear too much about. When we think “Jewish American history” we think Ellis Island, Lower East Side, and The Jazz Singer, not Shiloh, Chancellorsville, and the March to the Sea. The show is fascinating on its own. It is also a lesson in letting go of one’s preconceived notions whatever the topic. I had been looking forward to Passages since hearing about it over two years ago. The show is a continuation of sorts of a similar exhibition put on by the Jewish Museum fifty years ago during the Centennial. 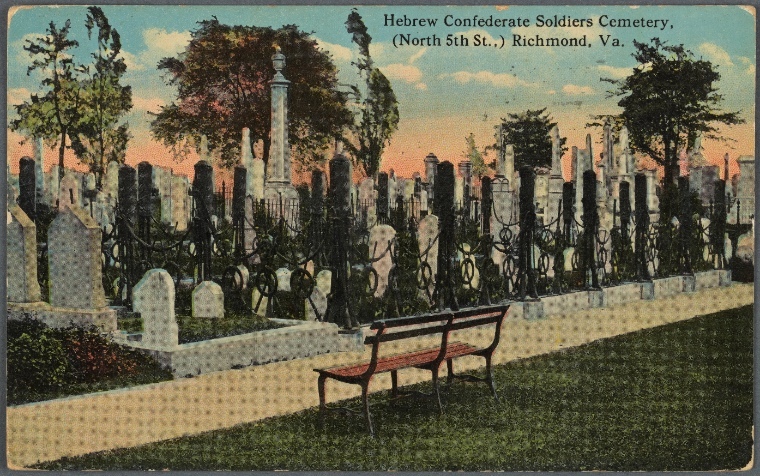 That 60s show, The American Jew in the Civil War, was a pioneering exhibit that examined the role of American Jewry in the War of the Rebellion, borrowing heavily from the expertise of the late Rabbi Bertram Korn. His is still the authoritative book on the subject. There were 125,000 Jews living in the United States in 1860, up from the 15,000 twenty years earlier. Approximately 10,000 Jews, many of them recent immigrants, fought in the war. They fought for myriad reasons, and as with all other groups the Jewish community had its share of heroes and scoundrels. The exhibit does not shy away from the complicated story. I was already intending to go back in the summer before it ends in August. I was only more excited to do so after hearing that they will be tinkering with the artifacts and signage in the coming days. If in New York try to see this one before it ends. Getting our sesquicentennial on, Gotham style . . .